Spring cleaning is upon us. It’s time to spring into action and get your home in order for the rest of the year. Housekeeping sometimes gets a bad rap for being time-consuming and fairly costly when you add up how many products you need to clean every room. Lucky for you and just in time for seasonal cleaning, we’re sharing some of our best time-saving and cost-effective pointers, repurposing household items throughout the tidying process. These are our top 10 spring cleaning tips and tricks to refresh your home and get organized this season. First stop on the spring cleaning list is to freshen the fridge. There’s no time like the present to get rid of old food and condiments, wipe down your refrigerator shelves and clean the bins and crisper drawer. Remove the bins to clean them in warm, soapy water, and let them dry before placing back in the fridge. You’ve probably heard of deodorizing the fridge using baking soda before, but did you know your morning coffee can save the day in another way? If baking soda isn’t doing the trick to deodorize your fridge, coffee also effectively absorbs bad scents. Lay freshly ground coffee, spread out evenly on a plate, in the fridge for 24 hours for a quick, inexpensive fix to old food smells. One of the tips my mom taught me that I can’t live without is to run a cup or two of white vinegar in your empty dishwasher every couple of weeks to prevent it from smelling. This is particularly helpful if you aren’t great at rinsing your dishes before loading them into the dishwasher. It’s easier than you’d think to give your garbage disposal a refresh. First, run a few ice cubes through the disposal to sharpen and clean the blades. Then, add a few lemon or orange peels in while the disposal is running to remove odors and start fresh with a mild citrus scent. This is a natural way to cleanse your garbage disposal, while also finding a great use for old citrus peels instead of throwing them in the garbage. Freshen up your shower drains with this inexpensive DIY spring cleaning tip. Mix ½ cup of baking soda and ¼ cup of table salt and pour down the drain, immediately followed by 1 cup of warm vinegar, which will foam with the mixture. After 15 minutes, run hot water down the drain for 30 seconds. Noticing water going down the drain more slowly than usual? TidyMom shares an easy, natural remedy to unclogging drains with vinegar and baking soda, so you can nip any drain clogs in the bud. This may sound like an oxymoron, but if you clean your house with dirty supplies, how clean can it really get? Spring cleaning is the perfect time to spruce up your most-used appliances and cleaning tools too. To clean your vacuum, make sure it’s unplugged, then empty the bag or dust compartment and use a damp cloth with mild detergent to wipe down the casing, hoses and all attachments. Using scissors or a seam ripper, you can easily remove hair and other fibers stuck on the beater bar and bristles to clean the vacuum’s brush. To clean your washer and dryer, wipe down the outside of the machines with a damp microfiber cloth and some mild dishwashing liquid. Then, rinse with a little bit of water and wipe dry. Wipe down the inside of your washing machine with a damp cloth to remove lint and detergent residue. 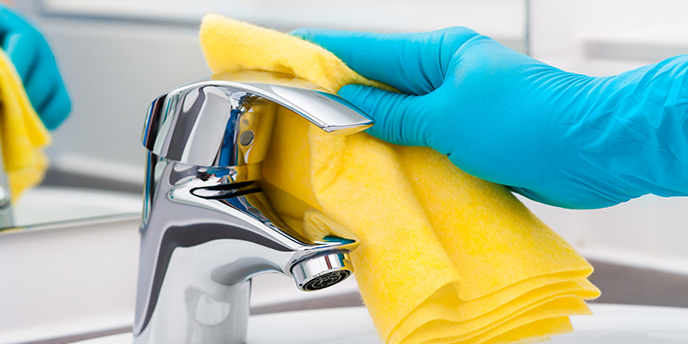 Spring cleaning is also the perfect time to replace disposable cleaning supplies, such as sponges and toilet brushes. While these items should be cleaned after each use, to prevent bacteria, it’s best to replace them once they get worn. Check out this deep cleaning checklist for more tips to tackle messes in every room in your home. Pace yourself, and focus on one room at a time. 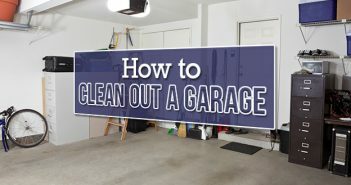 You’ve finally crawled out of hibernation and want to start spring cleaning, but if you bite off more than you can chew, you’ll run out of steam and give up before completing the project. One of our favorite spring cleaning tips is to wash your windows on a cloudy day, using a microfiber cloth. 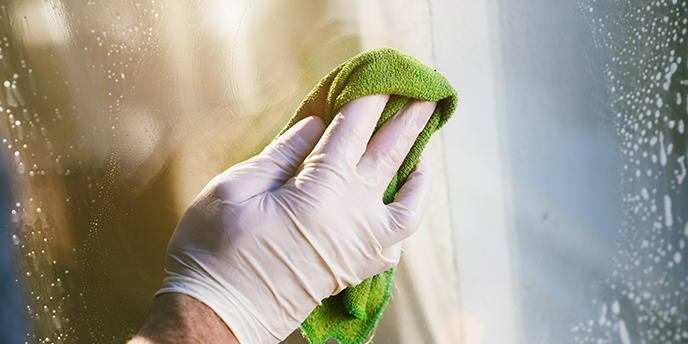 Since cleaner dries much quicker on warm windows, washing them in direct sunlight can cause streaks, as can wiping down your windows with paper towels. To clean your window treatments, you can use your vacuum’s upholstery attachment to remove dust, or you can put most curtains in the dryer on low with a fabric softener sheet for a deeper refresh. Another tip for cleaning your blinds shows that keyboard cleaner doesn’t just have to be useful in the office. Use a can of keyboard cleaner to quickly clear dust and dirt off your blinds, and vacuum the room when you’re done. With these tips in hand, you’ll have windows so clean, the birds won’t know what hit them. Nothing says “spring cleaning” like fresh linens. Now is the time to flip your mattress, wash your pillows and air out your comforters. We recommend washing your pillows with ½ cup of baking soda added to your detergent in the washing machine. To fluff and extend the life of your pillows, use the air cycle of your dryer and dry with two tennis balls in socks. Take your comforter and blankets outside to shake them out, and run them through the air cycle of your dryer with a fabric softener sheet for extra freshness. This is a great opportunity to flip your mattress as well, which you should do every six months. Ready to start fresh with a new bed altogether? Here’s how to dispose of your current mattress. 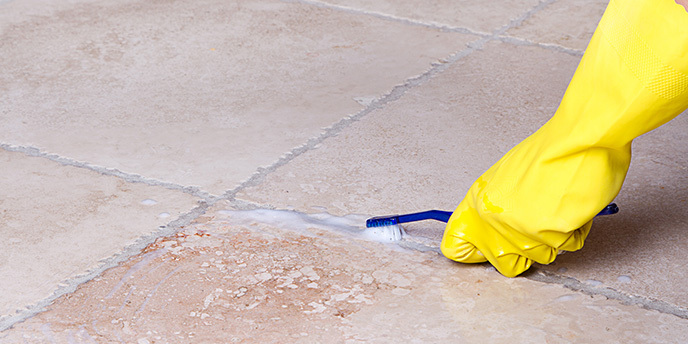 Your carpets and tile flooring take a beating throughout the winter, and this spring cleaning trick lets you clean both with a single product. While you’re freshening the carpeting with a foam carpet cleaner, like Resolve, you can also use it to clean your tile grout. Spray the carpet foam around the edges of each tile, and let sit for 10 minutes. Then, scrub the cleaner off with a scrub brush or old toothbrush. As you scrub, have a rag to wipe up the dirt that is released from the cracks. Your home gets dustier than you might think over the winter, but it can be hard to tell how much has accumulated when sunshine isn’t flooding in your windows every day. Luckily, there’s a simple way to tidy up with something you likely already have sitting around. Use dryer sheets to dust items like electronics, lamp shades and appliances. The sheets have anti-static properties that will prevent dust from settling back onto the screens or stainless steel. Dryer sheets can also be used to scrub soap scum off your shower doors, clean food residue off pots and pans, clean your blinds, pick up pet hair from your couch and more. House cleaners rejoice – Mr. Clean saves the day yet again. Armed with a Magic Eraser or similar product, you can tackle everything from marks to mildew across the rooms in your home. Put on some cleaning gloves, and you can use a Magic Eraser to erase scuffs from walls and baseboards, clean cabinets, eliminate soap scum and remove mildew from shower curtain liners. If you have hard water build up around your faucets, sink sprayer, shower head or refrigerator water tray, we have a natural spring cleaning tip to remove it with ease (and without harsh chemicals). Saturate the area you’re cleaning with distilled white vinegar, and let sit for 20 minutes. The easiest way to saturate your faucets is to fill the vinegar into a spray bottle and wrap vinegar-soaked paper towels around the handles. Then, use an old toothbrush to scrub the hard water right off. 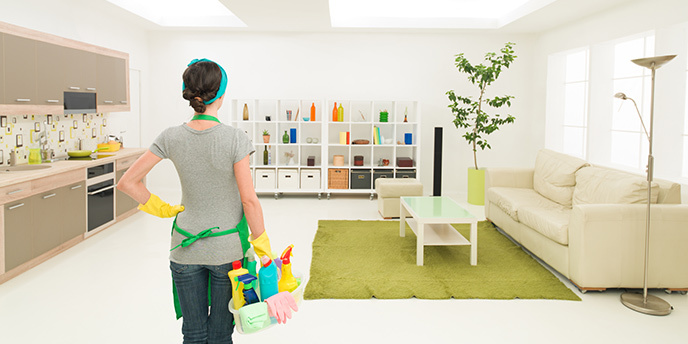 Equally as important to the deep cleaning phase of your spring cleaning is getting the house decluttered. We’ve assembled a few more essential guidelines to help get your home organized (and keep it that way year-round). While you spring clean your home, you should try to get organized as you go. Divide items you come across that you won’t need for the spring and summer months into three categories: throw away, give away and put away. Keep track of this, and organize items into their respective bins as you clean each room. My number one tip for staying organized is to take 15 minutes every evening after the kids go to bed to power clean. Also, I’ve gotten better at asking for help. Your partner, if you have one, should be shouldering their fair share of the chores. Some people feel bad about asking for help, but the truth is they shouldn’t have to ask at all. Keeping up a clean house is everyone’s responsibility! Regardless of what Mother Nature is up to outside, spring cleaning is the perfect time to get your dresser and closet in order. If you’re swapping out seasonal items, before putting clothing and accessories away for the year, evaluate if you truly want to keep an item or if you should donate or sell it. Joyful Abode shares some helpful tips on how to declutter your closet and stay organized, regardless of how many clothes you have. 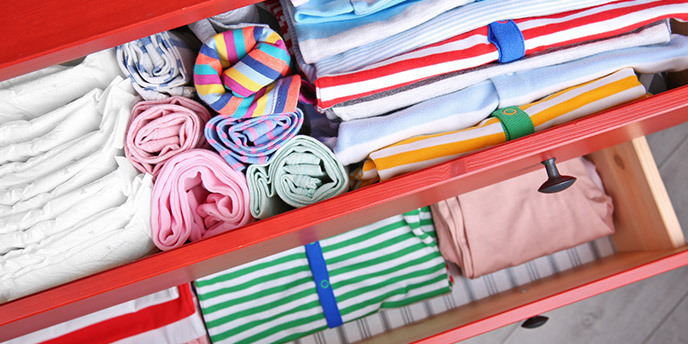 Another great spring cleaning idea is to try folding and stacking your clothes vertically to save space and neatly see all your clothing options as you’re cleaning out and reorganizing your dresser drawers. These simple spring cleaning organization tips will help make your life easier the rest of the year. Finally, sort through the random areas in your home that accumulate a mess, such as your home office, junk drawer or magazine basket and get rid of stuff you don’t need. Throw away old magazines, mail, expired coupons and receipts you no longer need. You’ll be surprised to see how much room these items are taking up and how much easier it is to find what you do need with all of this cleared out. The best tip we have for spring cleaning is to declutter before you start to clean. Go through everything in that room or space and determine to keep, throw out or donate the items. When you are finished, find a home for the items that you have decided to keep. Our motto for spring cleaning is, “out with the old, and in with the new.” Now is the time to assess what items you no longer have use for and clean out larger items that are causing clutter. If you’re ready to get rid of that old couch sitting in your basement or finally part with the old fridge in your garage, we can help. 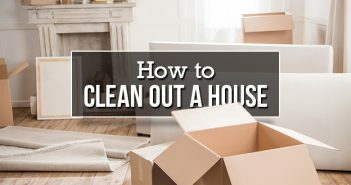 You’ll feel rejuvenated after this final stage of spring cleaning, getting rid of larger items that no longer belong in your home and truly starting fresh in your main living areas. Armed with these efficient ideas and simple tips, you should feel confident about how to spring clean your home this year. If you’re ready to take your spring cleaning and organization projects even further, check out this ridiculously thorough guide to decluttering your home. Have some spring cleaning tips and tricks of your own? Share them in the comments below.